Previous What Makes a Photo Shoot Title Nine Worthy? It is so vital to stay as fit, healthy and balanced in your life especially after the age of fifty. I started an organization called Get Fit in 5 for senior adults. I provide in home one-on-one training for seniors as well as teaching group exercise. The premise is to address their cardio issues, their muscular strength, muscular endurance, flexibility and body composition. The goal is to try and keep them in their homes for as long as they can. My grandmother got to the point in life that she was going to have to go to a nursing home. She rather die before going to a nursing home and she did. This is my passion that I can be of assistance to any senior like my grandmother that does not want to go to a nursing home to continue living in their home. What a wonderful program to start! Wow! Very inspiring and let me say that Teddy Roosevelt has got nothing on Missy Park! I recently founded an organization of women in direct response advertising and copywriting called The Titanides, named after the female goddesses of Ancient Greek mythology who literally ruled the arena. I love reading about the women in your catalog who are breaking barriers every day, who are living life on their own terms, who take no prisoners and give no excuses. Kudos to you all for creating such an amazing mash up of clothing and inspiration and motivation. And you and your marketers and copywriters are welcome to join us in Titanides too! “Titanides,”…that name rocks. Sounds like you are already in the arena, Marcella. Thanks for writing. but you all are veryinspiring! I started – fought for !!! A women’s Ice Hockey team in 1982. The boys said no but I kept fighting! We had crappy gear and uniforms but today the SM Women’s team is formidable !!!! So cool Jan! What a great story and an amazing accomplishment. I played boys hockey all growing up. I was a goalie. My mom and dad never said I couldn’t do something because I was a girl. More importantly for me, they allowed me to be both feminine and sporty in a world that told me it should be one or the other! I loved stopping every puck while wearing a ribbon in my braid flowing out of the back of my helmet! I was privileged to play womens hockey in college and see teammates play for the furst women’s Olympic team! Thanks, Mom and Dad! We’d like to thank you mom and dad too! Sounds like they did a great job raising a fierce, hockey-playing woman. Missy and Title 9 – please decide to step out publicly in support of Hillary. Yes you will lose some customers (not me of course and no one I know, but I am sure you will lose customers) but you have a platform. Please use it. I beg you. 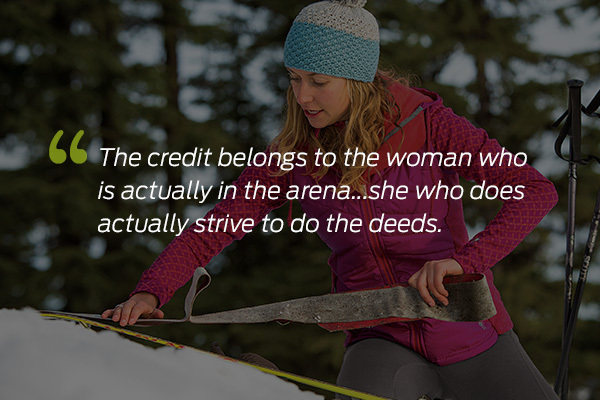 Isn’t that what the woman in the arena is about? If so, do the right thing and stand up for what you believe even if it is potentially alienating to some customers. totally agree, especially in light of recent Trump comments that betray how little he thinks of women, their power, agency and purpose. I disagree about Hillary Clinton being honorable. I find her to be a poor token of American women. If she had true strength and integrity, she would have left Bill Clinton after humiliating her so greatly with Monica Lewinsky. She seems like a mad dog with all her crazy tirades. Overpopulation is the single most important issue our country and the world faces. We must start discussing how it is ruining our country’s wilderness and wildlife. I was the first female line company commander of a Marine landing support battalion. My arenas these days include the trails, the schoolyard and soon, the workplace. I told myself after getting out of the service that I wouldn’t ever be so stressed out or frustrated, and that hasn’t been true. Progress in life isn’t a linear uptick, and I don’t know that I can even claim progress at this point, but I’m happy to have continued to have experienced stress and frustration, because that’s what’s in the arena, whether you’re the first there or not. So true Nicole. Thank you for sharing this! You go, Nicole! You ARE a woman in the arena and it is certainly more stressful being the first one in your chosen arena. Thank you for being there and making the road a little easier for the rest of us. My arena is being a pioneer in ceasing abuse cycles & replacing them with cycles of health & Love. I tried and successfully completed my first Olympic distance triathlon at age 50 this past Saturday. Five years ago, I was so sedentary I couldn’t run 200 yards or swim 100 yards without having to stop and gasp for breath. I love being amongst those type of people who have the guts to show up. It keeps me coming back and raising the bar for the next challenge! Way to go Janet! An Olympic distance tri is no easy feat. It truly is all about showing up, isn’t it? It’s a great quote! Brene Brown deserves much credit for bringing it into the forefront regarding her books on ‘Daring Bravely’ and ‘Rising Strong.’ Her books address the Woman in the Arena in an emotional courage sense, to encourage people to face challenges and follow your integrity, move past the arena fall and grow as a result. Please consider adding credit to her as you use the quote. Thank you! Thanks Lynette. We’ll check out her books! I have followed this belief throughout my life and career as one of the first wildland firefighters. I’m working on a unique and important project called “Women of Fire: Wildland” Oral History Project. This project will be an unforgettable journey into the lives of the women who battled wildfires in our nation’s forests and wildlands. It will tell the story of women who stepped into non-traditional roles to pursue their dreams of fighting wildfire, working outdoors, seeking adventure and a challenging profession, or fulfilling a sense of duty. Through their eyes and in their own voices, you will hear stories from these remarkable women. They will share who they are, why they fought fire, how they got started, how they dealt with nature’s extreme elements, and how they persevered. These dedicated women, like their male counterparts, have endured 16+ hour shifts of exhausting work in extreme environments, lived under harsh conditions with long separations from home and family to protect our nation’s communities and natural resources from devastating wildfires. •	First, to chronicle the individual stories of these women, recognize and honor their service and achievements, and highlight their contributions. •	Second, to inspire, empower, and encourage girls and women to pursue new challenges and seek future endeavors in fields yet unknown to them, no matter how daunting the possibility may seem. 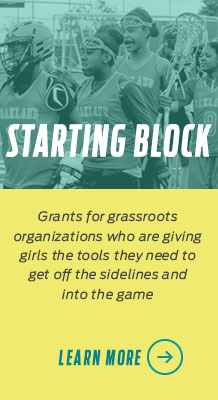 •	Third, to educate the public on women’s potential and contributions made in a field that demands a high level of physical and mental strength, teamwork, leadership ability, endurance, and courage. Time is of the essence as many of these women have retired, are retiring soon, or have left their fire careers to follow other pursuits taking their stories with them – many believing their stories are not important or worth sharing. If their stories are not collected and documented now, they will be lost forever. This project will prevent the loss of an important history and provide insight for both women and men entering the wildland fire service today. I’m in the process of seeking funding to help offset travel costs. Do you think that Title Nine would help support this project? Carol. What an amazing project! We are not normally able to provide cash sponsorships, but email us at socialmedia@titlenine.com and we can discuss it further.